I was reaching for a box high in my closet when it fell on my chest and while trying to rub away the soreness where the box fell, I felt a lump. It was at that very moment, before any screenings, biopsies or additional test, I knew I had breast cancer. I was diagnosed two weeks later with stage II breast cancer in my left breast and it had spread to my lymph nodes. Of course the news was devastating, but I had to be strong. My children were going to follow my lead so I made the decision to persevere and keep moving forward. I knew what really mattered was my attitude. I wanted to live so I could be a mother to my children and eventually a grandmother to my grandchildren and I am fighting to do exactly that. There was no doubt in my mind I wanted a bilateral mastectomy. I wanted to minimize any chance of this returning in my other breast. Two weeks after my diagnosis, I had a bilateral mastectomy with immediate reconstruction and then continued my journey through over twenty long, hard, sick filled weeks of chemotherapy. 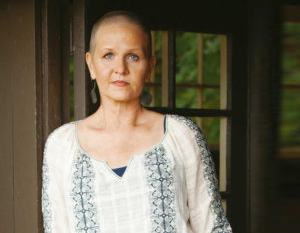 After three weeks of chemotherapy, I stood in the shower and cried as clumps of my hair washed down the drain. I got out of the shower, dried my tears and thanked God I was still alive. When I lost my breasts and hair, I felt unattractive, but the incredible outpouring of unconditional love from all my family and close friends made me feel beautiful inside and out. True beauty lies in who you are, not what you look like. It is sometimes in your weakest moments you find your greatest strength. It may seem strange, but I have tried to think of cancer as a gift. The kind of gift that makes you recognize and appreciate the fullness of your life for having received it. It hasn’t been fun and it certainly hasn’t been easy, but I feel my life is richer and fuller for it. I never could have made it without the support of my family and close friends. Recovery does not happen in a day, a week or sometimes even a month. Listen to your body and trust the small voice inside you.